This beautiful bolo was handcrafted and signed by well-known artist Vidal Aragon from the Santo Domingo Pueblo in New Mexico. Vidal began his career in the 1930s studying jewelry making at the Santa Fe Indian School. His career spanned 70 plus years of design and craftsmanship of the most beautiful story teller and unique designed pieces. He passed away in 2015 and will be missed by many that knew him. 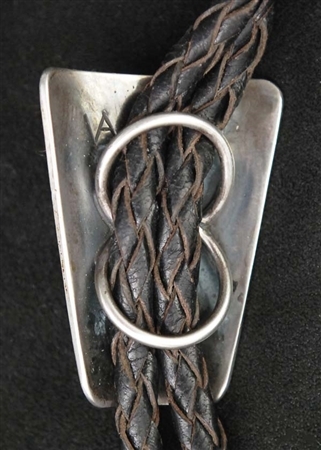 This bolo is a fine example of his workmanship. 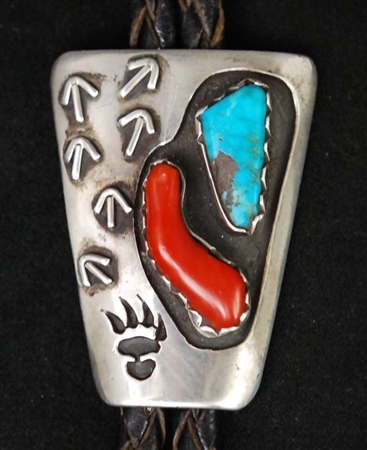 A natural top grade Morenci turquoise cab and coral branch are placed along side of raised turkey tracks and a overlay bear paw. Hallmarked with his connected VA and foot. The bolo measures 1 1/2" long by 1 1/8" wide. The leather is 18" long including 2" silver tips.